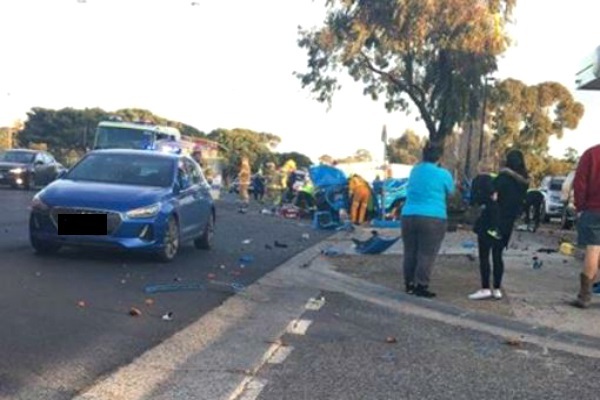 Police have blamed “excessive” speed for a Norlane crash that ripped a ute in half and left a passenger fighting for his life on Wednesday. Alcohol and drugs could also be a factor, with police awaiting blood test results. Geelong Highway Patrol Acting Sergeant David Ramm described the crash as the worst he had seen. “The car’s basically been ripped in half,” he said. The driver was travelling “an excessive amount above” the 80km/h speed limit on Princes Highway, Norlane, when he lost control at 4.40pm on Wednesday, Sgt Ramm said. The ute veered off the road and slammed into two trees near a BP service station. An ambulance helicopter airlifted the passenger, a man in his 40s, to Royal Melbourne Hospital on Wednesday afternoon. He remained in a critical condition this morning, a hospital spokesperson said. Geelong Indy understands he was clinically dead at the scene before paramedics revived him. An ambulance took the driver, also in his 40s, to Geelong hospital with serious injuries. “He wasn’t as bad as the passenger,” Sgt Ramm said. Paramedics later transferred the man to The Alfred Hospital in Melbourne in a stable condition, a Barwon Health spokesperson said. The horror smash could have been worse if the ute missed the trees and collided with the service station instead, Sgt Ramm said. Sgt Ramm said the men were in their early to mid-40s and both had links to Geelong. One of the men was from the north of Geelong and police had notified both their families, he said. But he declined to give any further information this morning, saying police had yet to confirm they had notified all family members. Police reopened the road at 5am this morning after diverting traffic away from the scene on Wednesday. Victoria Police’s Major Collision Investigation Unit continued its investigation of the crash today. Police urged anyone with information or dashcam footage to phone Crime Stoppers on 1800 333 000 or visit www.crimestoppers.vic.gov.au.